Twenty years ago Karabakh and Armenia on one side and Azerbaijan on the other signed an agreement on ceasefire that would put an end to nearly three years of brutal war that claimed thousands of human lives. During the Karabakh war and the following 20 years of ceasefire information war has been a constant ‘companion’ of the conflict. Angela Elibegova, a specialist in Azerbaijani studies based in Yerevan, says as the winning side in the war Armenia didn’t pay much attention to the informational confrontation for a long time, however when Azerbaijan started intensively distorting various facts about the conflict and the war and spreading them Armenia began developing a wide range of response mechanisms on an official level. It’s with great paternal pride that veteran “freedom fighter” Gagik Hovhannisyan dines at a table together with his seven sons and five daughters. Bringing up a dozen children wasn’t an easy task for Hovhannisyan and his wife, Armenuhi Manukyan. Ceasefire 20: Minsk Group activities – failure or success? Despite the 20 years of ceasefire agreement after the 1991-1994 Karabakh war regular demining work continues to be carried out, until today people die because mined areas still serve as protective means in conditions of an unresolved conflict in Armenia and Nagorno-Karabakh. Mariam carefully draws the dark curtain of the bedroom on the second floor of her village house, and the sunrays, taking advantage of that opportunity, crawl inside and cover the teenage girl’s eyes. Bullets being released from the highest Azerbaijani post reflected in her eyes have violated the village peace for years and reminded of the unresolved conflict and the ceasefire existing for the community perhaps only on paper. May 12 marked the 20th anniversary of the establishment of ceasefire in the Karabakh conflict zone that put an end to hostilities and bloodshed in a war that lasted for nearly three years. But after two decades of the “neither war, nor peace” state, the still simmering conflict continues to hang as a sword of Damocles over the heads of the peoples in the region. 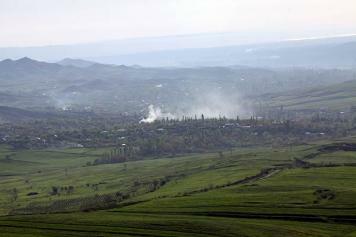 May 2014 will mark the 20th anniversary of the Karabakh ceasefire when after nearly three years of fierce fighting guns finally stopped firing and people started talking. The main international format advancing the negotiations is the Minsk Group of the Organization for Security and Cooperation in Europe (OSCE). Its co-chairing nations are Russia, the United States and France. The moon-shaped wound on the head of Mamikon Khojoyan, 77, is testimony to a nearly two-month captivity and violent torture by Azeris, who took the man hostage when he wondered into enemy territory last winter. Next month will mark the 20th anniversary of the establishment of ceasefire in the Karabakh conflict zone that put an end to hostilities and bloodshed in a war that lasted for nearly three years. Armenian revolutionary Stepan Shahumian’s headless mosaic greets visitors at the entrance to the Karabakh village of Sos. The head on the hero’s Soviet-era image was blown off by Azeri shelling more than 18 years ago, and there seem to be no plans for restoration. Honoring heroes is a less urgent need than producing new ones. And with many of Karabakh’s 301 villages losing their youth to Karabakh cities or to other countries, concerns outgrow populations. A veteran of the Karabakh war is holding two photographs in his hands – one has three little boys in it, the other three soldiers – arms around one another’s shoulder. At first there seems no connection, but after taking a closer look the resemblance becomes obvious – the same eyes, same faces and same expressions in the eyes, with only age and maturity showing the difference. Not too long ago, would it seem possible that youth in Nagorno Karabakh would now be celebrating Halloween – dressing as ghouls and goblins and ghosts in this war-worn country? And the simple – and yet astounding – act of self-expression is indicative of how one generation which may never outgrow the impact of war, has at least developed an outward world view and a spirit that embraces freedom.